Actinomycetes are a remarkable type of bacteria. So far we know they function in at least three important ways. the Frankia family, works in a symbiotic relationship with many non legume plants as nitrogen fixing bacteria. other actinomycetes are decomposers digesting tough plant tissues like the cellulose and lignin in bark, paper and stems and the chitin or hard exoskeletons of insects. Actinomycetes are a fungi-like bacteria forming long filaments that stretch through the soil. They have sometimes been classed as fungi because they both look like, and decompose similar material as fungi. However, they have no defined nucleus. As well antibacterial agents work against them but antifungal agents do not. So now we can call them actinobacteria. Scientists have long known that actinomycetes somehow kept soil bacteria populations in balance. This fact led scientists Selman Waksman and Albert Shatz to think that some of these actinobacteria might be useful as antibiotics against human disease. Shatz was particularly driven by his experience as a lab assistant at a Miami Hospital during the 2nd World War. Here he witnessed the death of many young soldiers at the hand of penicillin immune infections, especially Tuberculosis. Shatz, when released from the Miami Hospital returned to Dr Selman's lab at Rutger's University. On October 19th, 1943, after three months of work, he managed to isolate two strands of actinobacteria that could effectively stop the growth of penicillin resistant bacteria. Streptomycin, the first antibiotic to cure tuberculosis, was the result of this work. Streptomycin is still used, but in combination with other drugs, in the battle against TB. 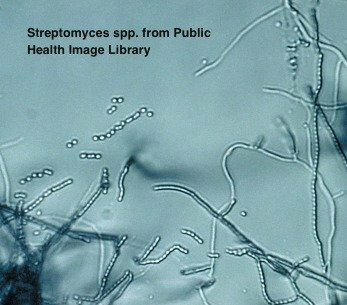 The Streptomyces produce over two-thirds of the clinically useful antibiotics that are natural in origin including Erythromycin, Neomycin, Tetracycline and Cefoxitin. Kind of puts mud baths and masks along with the age old childhood habit of eating dirt in a different light, doesn't it. Nitrogen is a critical nutrient for virtually all lifeforms. We get our nitrogen either directly or indirectly from plants. While nitrogen makes up about 79% of our atmosphere, plants can not use nitrogen in its gaseous state. It first must be fixed or combined into either ammonia, NH3 or Nitrate, NO3. 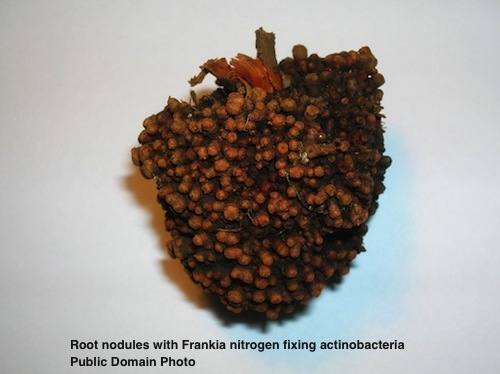 The natural nitrogen cycle relies on nitrogen fixing bacteria like those found in the Frankia family of actinobacteria, to supply the fixed nitrogen. Fixed nitrogen is often the limiting factor for growth, both in your garden and in the general environment. About 15% of the world's nitrogen fixed naturally is from symbiotic relationships between various species of the Frankia family of actinobacteria and their host plants. The plants that form symbiotic relationships with Frankia are called actinorhizal plants. Scientists have found over 160 plants that host these actinomycetes including alders, Russian olive, bayberry, sweet fern, bitterbush and cliffrose. The Frankia is able to provide most or all of the host plant's nitrogen needs. Here is a photo of the very cool looking nitrogen fixing nodules on an alder root. These nitrogen fixing bacteria and their host plants are often pioneer species on young nitrogen deficient and disturbed soils such as moraines, volcanic flows and sand dunes. They help create a reservoir of nitrogen rich soil that the next wave of plants can benefit from. Scientists believe that much of the new nitrogen in temperate forests, dry chaparral, sand dunes, moraines, and mine waste tailings is thanks to the mutualism of Frankia and host plants. They are the main nitrogen fixing relationships in large parts of the world and will only become more important as we adjust to climate change. As a decomposer the actinomycetes specialize in breaking down tough cellulose and lignin found in wood and paper and the chitlin found in the exoskeletons of insects. The breakdown of these materials makes nutrients once again available to plants. The "earthy" smell of freshly turned soil is caused by actinomycetes at work. 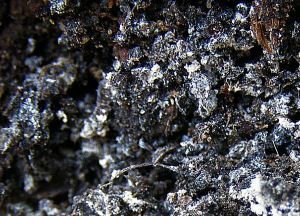 While some species of actinobacteria are thermophiles, loving the heat of an active hot compost, in my own compost pile I find them in the outer two to six inches of the heap. During the long cool curing stage of compost they extend their hyphae like threads throughout the compost. They are those whitish grey cobweb like threads like you can see in this picture. To help both the actinobacteria and fungi to develop in your compost stop turning your pile during the curing phase. You'll have a nice rich batch of soil life to innoculate your garden beds with. If lazy like me - you can tell people you never turn your pile so that these amazing critters can flourish.